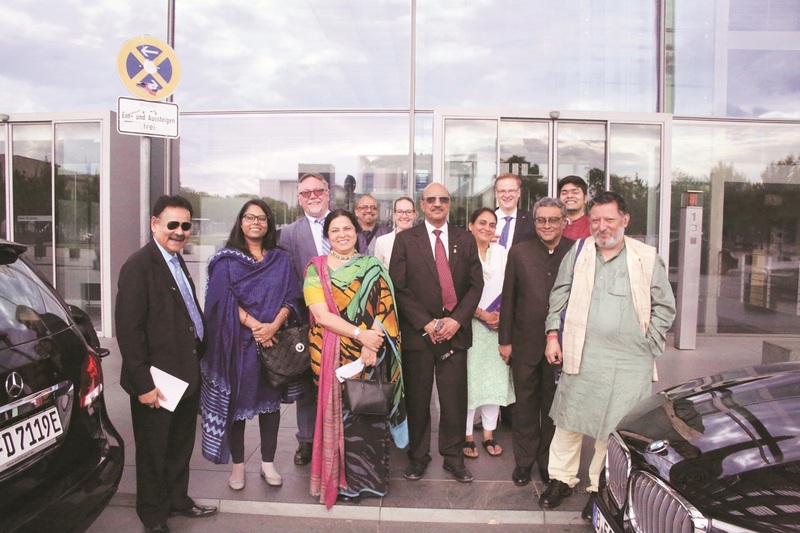 India Foundation, in collaboration with Konrad-Adenauer-Stiftung (KAS) organized a delegation visit to Germany and Belgium from June 24-29, 2018. This delegation of experts and politicians from India exchanged views on foreign and security policy with experts, politicians and military officials from Germany and understand key German and European security institutions. The visit began in Brussels with a meeting with Mr. Gunnar Wiegand, Managing Director Asia and Pacific, European External Action Service, who spoke about a warming up of EU-India relations and acknowledged the successful visit of Smt. Sushma Swaraj, Minister for External Affairs, Government of India, earlier in the month. He mentioned that EU is coming with a strategy document on India relations later this year and even under its present EU-Asia strategy there is a very strong effort to grow our engagement beyond trade to other policy areas like cross-border terrorism, cyber-security and migration. Mr. Wiegand emphasized that the 2016 US elections and Brexit have increased EU’s interest in Asia and it wants to be India’s main partner in its modernization drive. Acknowledging the Hon’ble Prime Ministers speech at Shangri La Dialogue, he highlighted the convergences with India on regional security and principled connectivity. The fiscal sustainability of Chinese infrastructure projects like Hambantota port has raised concerns in EU and efforts must be made to ensure that projects are fiscally sustainable. The second meeting was with Dr. Wolfgang Klapper, Ambassador and Vice-President, East West Institute. He was joined by Mr. Kawa Hassan, Director, Middle East and North Africa Program Regional Security Initiative; and Ms. Annie Gowan, Program Associate, Afghan Regional Security Initiative. Dr. Klapper explained that the institute played a key role in building trust between traditional rivals like Iran and Saudi Arabia which held a dialogue in 2015. The third meeting was with Major General Manione, Deputy Head, European Union Military Staff. He said that EU was basically a political and economic union which had been pushed to create military capability which could intervene during a crisis. Some operations of EU Military include Operation Sophia in Mediterranean and Operation Atlanta in Gulf of Eden. The operational command of the military mission was nationally owned but lent to EU and there is a multinational staff at EU quarters. Last meeting for the day was with Mr. Gabor Iklody, Director, Crisis Management and Planning, EEAS. He said that the unit was instrument for EU Common Security and Defence Policy and in charge of operational and civilian planning. It was an integrated civil and military entity. Mr. Iklody noted that although defence expenditure of EU members had declined in the last decade they were still spending 220 billion euro per year which was more than Russia and China. Countries are focusing on total defence approach and whole of government approach at national level and EU is looking for defence co-operation with international partners. The crown jewel of this international cooperation would be a partnership with India. On June 26, the delegation participated in a breakfast event on the topic “Geopolitical Trends and Challenges: Implications for India’s Regional Security” which saw participation from various foreign missions in Brussels, think-tanks and political establishment. This was followed by a visit to Mr. ElmarBrok, MEP, Member of Delegation for relations with India and Committee on Foreign Affairs, European Parliament. He highlighted his concerns about BRI being one of the most aggressive initiatives by China to get dependence of other countries including in Europe. He noted that the cancellation of TPP has created a vacuum in Indo-Pacific and that is of concern to European companies looking for open market access. The delegation’s final meeting in Brussels was with General Mikhail Kostarakos, Chairman, European Union Military Committee. He began by expressing his hope for greater military exchange with India. He said that EU is not a military alliance and EEAS functions as its combined military and diplomatic arm. EU was interested in keeping sea lines of communication open and wanted to work together on maritime security. On June 27, the delegation began meetings in Berlin starting with Mr. Jan Techau, Senior Fellow and Director, Europe Program, German Marshall Fund. His presentation focused on the loss of order at three levels: within EU, in transatlantic relations and domestically within member countries. It was a consequence of the adaption of an old political system to the new social realities of a united Europe. Deep integration with a single currency and one social policy is being met with resistance. This combined with external pressure is a double whammy for stability of EU and it is facing adaptation stress. The second meeting was with Dr. Christian Wagner (Senior Fellow, Research Group Asia of SWP). He began by highlighting the difference between South Asia, Southern Asia, Extended Neighborhood and Indo-Pacific- each being a progressively larger geographical concept. China’s BRI was changing South Asia and the conception of the region. He noted that regionalism in South Asia was weak and all nations in the region played the China card. There was more bilateral trade with China than intra-regional trade and therefor no incentive for regional cooperation. India was accordingly cooperating with other powers to respond to BRI with initiatives like North-South Transport Corridor and India-Africa Growth Corridor. The next meeting of the day was an interaction with Member of Parliament Mr. Markus Koob, Member of the Committee on Foreign Affairs and other members of German-Indian Group of Parliaments on the topic of Germany’s current international and security challenges with regard to India. In course of the interactions there was exchange of views on security situation in Afghanistan and Iraq-Syria and the MPs noted that the situation in both countries was neither stable nor optimistic in the near future. Finally MPs reiterated the need to conclude a Free Trade Agreement between India and EU to further deepen our relationship. Final meeting of the day was with Prof. Dr. Gunter Krings, Parliamentary State Secretary in the Federal Ministry of Interior, Building and Community to discuss BMI in the context of national and international security requirements. His presentation was primarily focused on threat of radical Islam especially from foreign returned fighters of ISIS to Germany and secondly on cyber-attacks. Several ISIS fighters and jihadis who returned were actually German citizens and it was very difficult to turn them away. They mingled with migrants freely and could easily radicalize such migrants. This meant a greater reliance by security personnel on intelligence networks. He observed that the war on terrorism was always in conflict with privacy norms and one had to strike a balance. While data privacy should be built into our digital architecture, there should be need-based access because the threat of extremism was too overwhelming to be ignored. On June 28 the first engagement was a breakfast discussion on the topic “India: Current Security and Foreign Policy Challenges”. The panelists were Mr. Swapan Dasgupta and Major General Dhruv Katoch from the delegation along with Brigadier General Rainer Meyer zumFelde, Senior Fellow at Institute for Security Policyat Kiel University. The discussion was moderated by Dr. Garima Mohan, Research Fellow, Global Public Policy Institute, Berlin. The second meeting was with Commodore Axel Deertz, Head of Division 22, the Federal Chancellery, on the topic “Germany’s current international and security challenges with reference to India in context of Global Governance”. He highlighted the twin problems of migration crisis and Russian aggression as key security challenges for Europe. The final meeting of the delegation was with Mr. Mark Hauptmann, Head of the International Commission for Foreign Affairs, European Affairs and Security Policy. The agenda for discussion was “International and security challenges in the current parliamentary term.” He focused his remarks on energy security and trade agreements. He noted that Germany had made substantial investments to shift to renewables energy, including providing subsidy to individual farmers engaged to become energy producers. While talking about a pending FTA agreement with India, he was also apprehensive about the end of a US-led international trade regime. He acknowledged that concluding FTAs was not easy and depends on the country involved. After the final meeting, a city tour was organized for the delegation followed by a dinner to conclude the visit. The delegation returned back to India on June 29.